This is a concentrated cleaning liquid for vinyl records, based on an advanced alcohol free formula that contains non-toxic and non-flammable ingredients. Thanks to it's ultra thin molecular structure, it will penetrate effectively into the vinyl grooves and regardless of the depth and intensity of the print will efficiently and effectively regenerate their surface. A gentle treatment is enough to remove static, to restore vinyl shine and to eliminate noises caused by dust, residues and moisture. Cartridge life expectancy is also increased. A proper mix with distilled water will completely dry after treatment, without leaving any thin-walled layer on vinyl surface. In practice, the record cleaning fluid will help phono cartridges to achieve the optimum contact with the grooves of records and to reveal all the printed information with higher accuracy and increased clarity. 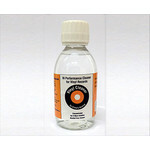 Simply Analog vinyl cleaner is ideal for record cleaning machines and for use with vinyl cleaning cloths.